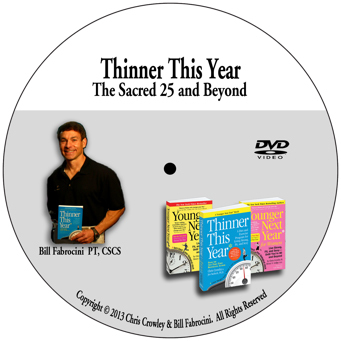 The Sacred 25 and Beyond is a step by step demonstration and explanation of the whole body exercises featured in Thinner This Year, the sequel to the NY Times best seller, Younger Next Year. Physical Therapist Bill Fabrocini, who created this exercise program, guides you through a unique series of strength exercises providing instruction and helpful tips on how to maximize the benefits. Emphasizing the importance of whole body movement, this DVD shows you how to incorporate stability and strength training into your exercise program so you can get lean, strong, and enhance your body’s function and performance. 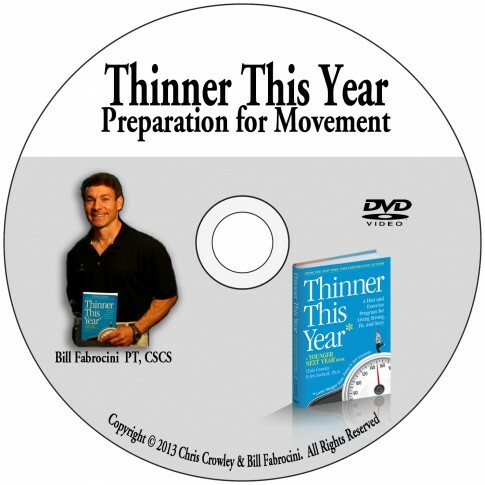 In Preparation for Movement Bill Fabrocini guides you through what may be the most important part of his exercise program covered in Thinner This Year. Preparation for Movement goes way beyond the traditional warm-up and is critical to prepare you for exercise training (strength and cardiovascular), sports, and daily life. 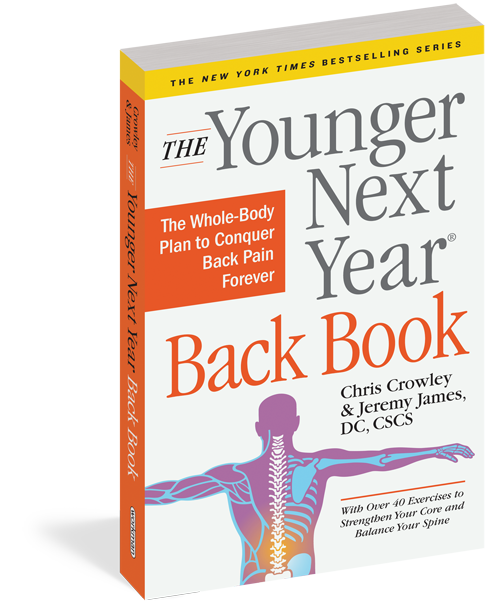 The exercises and methods covered in this DVD provide the keys to enhanced joint mobility, postural alignment, muscle activation, and whole body stability. TTY_Trailer wOrder from Chris Crowley on Vimeo. TTY_StreamWU from Chris Crowley on Vimeo. Hey Dave, quick story, this morning I decided I was going to bring the book to the gym and try the Preparation for Movement chapter, in reality I wasn’t expecting much. The woman I work out with came by and joined me. Of course she was trying to make them tougher, so I told her its not a workout, its a warm up, and to just chill out and try it out. We went through it fine and then went to spin class. I get on the bike, not even thinking about what we had just done and I suddenly thought to myself, I feel pretty good, loose and comfortable. I was going to say something to Maria but decided against it because I didn’t want her to …. well you know give me a look like I was nuts. A few minutes later she turns to me and says, Hey I feel really good! I’m shocked at the difference it made. As I said, I wasn’t expecting much, but being the Kool Aid drinker that I am I had to try it out anyway. 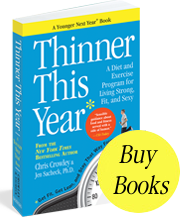 Oh by the way….down 7 lbs since you gave me the book, and that includes the holidays!, Beverly has lost 5, on diet alone as she hasn’t been working out too much yet. Hi gang, I went to order the prep for movement and sacred 25 DVD, and found out that amazon can’t ship them to Canada. And of course, amazon.ca doesn’t list the items for sale. Do you know of a store that sells them in Canada, or alternatively can I buy them directly from you? So sorry to be so late getting back yo you Al. If you are still out there and interested, yes, you can but it is involved. You have to send a money order to Bill Fabocini and he will send the DVDs to you upon receipt. let us know if you are still interested. Hi, I would like to take you up on the suggestion of having a CD shipped directly from Bill. I am interested in the both the sacred 25 and the other one dealing with preparation for movement. As mentioned I am living and working in Dubai and could give my address here, and happy to pay for the shipping, or could give my Canadian address as will be visiting there in a few weeks. I assume there is no download version available? So much easier! Thanks…. Hi Mark, Sorry to be so late seeing this. Please email fabrocini.bill@comcast.net if you are still interested. Byt the way, there is a new book due out December 15th. The Younger Next Year Guide to Exercise. But the DVDs are another – great – thing too.